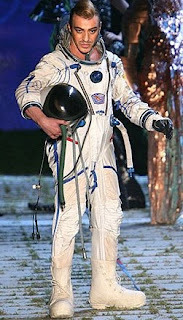 Some out of this world accusations are surrounding genius designer John Galliano. At a Parisian hot spot, a couple has accused Galliano of saying some not so nice things, police were called. NOW! Dior has suspended him. Call us one-sided but we don't believe Galliano is confrontational at all, much less would resort to ghetto name calling. Dior F/W 2011-12 show is March 4th; Dior has asked Galliano not to punch the time clock while this is being investigated. The police statement: Witnesses called police during the incident, which took place in front of dozens of astonished revellers in a busy covered terrace. A police source said: 'We arrived extremely quickly and managed to break up the disturbance. The man involved was briefly arrested and then released pending charges for assault. On Thursday night at the posh fashion bar “La Perle” in Paris’ lively “Le Marais” quarter, the Dior head designer might have had a couple of glasses more than he should have. In fact, the designer was pretty drunk but rather in a jolly mood than in an aggressive one. Our witnesses tell us that the couple who sat next to him at the bar didn’t recognized the celebrity designer and started to insult him, mistaking him for a bum when he tried to strike up a conversation with them (Galliano’s personal style could be at fault here). The boyfriend of the women then got up from his chair and aggressively charged it to threaten the designer. Galliano’s bodyguard tried to quiet the situation, as did the staff from “La Perle”, but there was nothing more to do; Galliano and the couple exchanged further insults untill the couple called the police while Galliano calmed down and was peacefully smoking his cigarette. The end of the story, far less dramatic the the press reported, the police just talked to the designer while his bodyguard was on the phone with his lawyer and Galliano conceded to go with them to the police headquarters to give his version of the story, since the couple wanted to press charges. No big police arrest took place. As for the antisemistic statements, Galliano did call the man who threatened him with a chair “Asian”, which is indeed a racist statement.